The 20 lb. 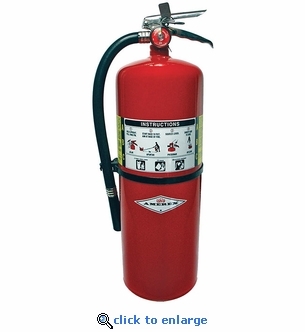 Amerex B423 multi-purpose ABC fire extinguisher includes a wall mount bracket and has a UL rating of 10A:120B:C. Approved for use on class A, B & C fires, these popular ABC Dry Chemical Fire Extinguishers are ideal for commercial buildings, industrial facilities, garages, work shops and apartment buildings. Amerex ABC or Multi-Purpose fire extinguishers utilize a specially fluidized and siliconized mono ammonium phosphate dry chemical. The extinguishing agent chemically insulates Class A fires by melting at approximately 350� F and coating the surface of burning materials. It smothers and breaks the chain reaction of Class B fires and will not conduct electricity back to the operator. Note: ABC dry chemical agent is not the appropriate agent for fire protection for aircraft. Range (Initial): 15 - 21 ft. Cannot ship to AK, HI, FPO/APO/DPO addresses or internationally. Expedited shipping is not available for fire extinguishers. These fire extinguishers are delivered charged and ready to use.